Transforming a piece of paradise into a place that feels like home is a delicate balance between nature and lifestyle. After a lot of planning and thought, ultimately the land tells you what to do. And, you design something that is as special as the place. 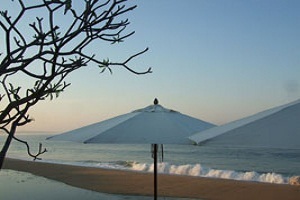 About a one hour drive from the town of El Tuito, south of Puerto Vallarta, is an area of pristine, virgin beaches. It is a place that surprised us, as it does all who discover it. It is unexpected. That became the overriding criteria for the design of the house I call Casa J. Create something that is equally as unexpected. The nature part of the plan was obvious, keep things as natural as possible, leave the beautiful trees, and use nature’s resources in the architectural design. The lifestyle part, for me, was to baffle expectations for a house in this undeveloped area by creating a unique high-end house. 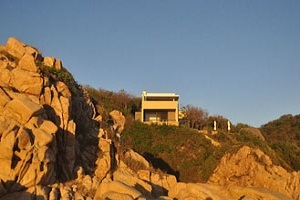 In contrast with the usual stereotype grand, high-color and tiled homes associated with high-end Mexican coastal living, Casa J is a contemporary, minimalist style, influenced by mid-century modern architecture. 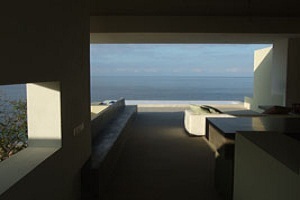 It is open in its design and incorporates the setting, and amazing views seamlessly into the design. The house is as visually interesting as the setting without distracting your attention from the ocean, beach, and landscape. In a place like this you also want to be smart about the environment and your consumption of water, energy, and fuel. A modern house today should be eco-smart. Casa J does not wear a lot of environmental features as a badge – it is just quietly smart. Hot water is from a thermal solar system. Rainwater is captured and used. Our water comes from our own well and water system. Grey water is recycled and used for landscape. Black water is treated in a Biodigestor system. Our fuel is from a single source, propane, fueling our stove, clothes dryer, and a backup generator. A leading technology, multigate micro inverter solar system, ties us to the power grid. We generate more power than we use. The 70 LED lights at Casa J, consume a total of only 315 watts. In addition, the design considers thermal mass, and natural air convection. A great deal of thought went into making this a house that just quietly does what it is supposed to do. It lets you relax in a creative and visually stimulating environment, and enjoy this amazing paradise that I call Chachalaka.